Mobile? Please use Desktop and Landscape modes - sorry! Just cut to the chase? Click here for pricing! What-You-See-Is-What-You-Get... and that's great, if What-You-See-Is-What-You-Want! When we launched Mountain Song Wind Chimes it was because what you want might be something rather different. 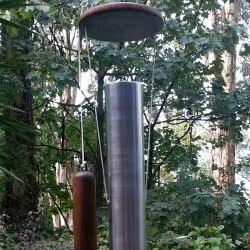 If you're about to order a chime set you'll be listening to for the next twenty or thirty years, don't you feel you should have a say in it? This page will tell you how and why we're different. Yes, we can supply off-the-peg but we prefer always to make your wind chimes especially for you... tailor-made at no extra cost! 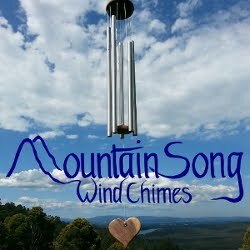 Mountain Song Wind Chimes are produced using aluminium tubing hand-polished to a silk or satin sheen, with support parts in bamboo laminate or, on request, from Australian hardwoods. Our wood is reclaimed, upcycled, or taken from a sustainable source, and might be cut from trees felled locally otherwise destined for chipping or the fire grate, or from beautifully aged timbers rescued following demolition of an old building. After sawing, drying, turning/cutting, and sanding, we apply several coats of Australian-made water-based polyurethane finish, tough enough for marine use and formulated especially to withstand the unforgiving Australian climate. Select too the shape and style of the windcatcher (or sail - the bit that hangs below the chimes) and please do feel free to suggest other features you'd like us to consider. If your order is for an anniversary, retirement, birthday, or other gift - or perhaps for a memorial or commemorative - we'll be pleased to laser-engrave the windcatcher with an inscription. For a nominal additional charge, this works beautifully to personalize your gift. *Thin-walled = 'lighter sound'; thick-walled = 'deeper resonance'. **Smaller chimes tend to be in the higher octaves, while larger chimes are generally lower. A hallmark of Mountain Song Wind Chimes is our attention to the smallest detail. Chime notes in any set are carefully chosen to balance with one another. A key factor in the pitch of a chime is its length; rather than simply chop-and-hope, we cut each chime initially overlength, and then trim back for precision tuning. It takes time, but we know it's worth the effort. Rough tuning is usually by ear, afterwards using an audio spectrum analyzer to attain spot-on pitch. Before polishing, each lip is rounded inside and out. Not only does this work to improve the aesthetic, but it ensures safety if small fingers find their way to where they shouldn't! Mountain Song Wind Chimes are polished by hand while spinning each chime on a wood lathe. Several process stages bring the surface to the brushed aluminium satin or silk finish required. 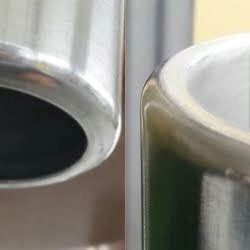 There is an art to achieving consistency in the sheen, and again, it takes a little time and patience... yes, we could just paint or otherwise coat the tube's surface, but we prefer 'gentle simplicity', and choose not to (see Q&As for more on this). The finished surface is not limited to the outside of the chime, either! As far as is practicable, we polish a little of the inside too, at least as far as you might be able to see into the chime when it is hanging in a tree or from your verandah or pergola. If there were a question we hear more than any other at Mountain Song Wind Chimes it would be: "How long is this string going to last, then?" - delivered almost accusingly! And you get a sense of bad experiences with wind chimes and string! We use micro paracord to suspend chimes from the support plate. Though we don't make a habit of it, a single length will easily take the load of an entire set of our largest chimes. 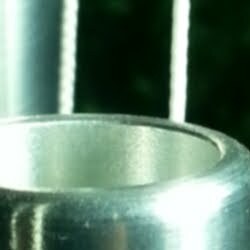 To relieve a potential wear-point where the paracord passes through drilled holes in the chimes, soft aluminium nylon bushes are inserted to protect it. 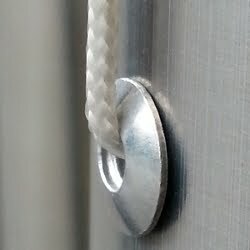 They extend well into the tube wall, providing a larger contact area for the paracord to bear each chime's weight. Micro paracord is made in the same way, to the same stringent specification, and from the same UV-stabilized nylon as regular parachute cord - it's just thinner. It won't rot, and it's immune from fungal attack. Wherever the paracord is tied off, the end is first heatsealed to prevent it pulling through. 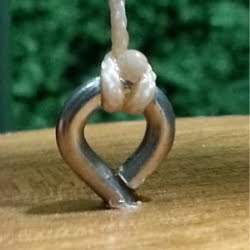 This makes for a compact and low-profile knot, which at the same time is very strong. Each chime is suspended using its own cord, rather than one length threaded through the whole set. 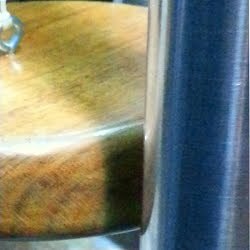 This ensures that even if the cord should break, all chimes will not come crashing down. The support plate holes are counterbored to conceal knotted cord ends. 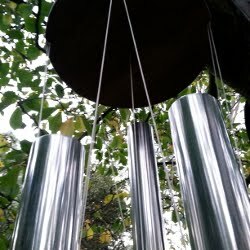 Mountain Song Wind Chimes is very well placed to consider your request to investigate other uses and options for these wonderful instruments. The windcatcher can be any shape from star, heart, crescent moon, swirl, diamond, teardrop, or any shape we can reasonably cut out and sculpt. 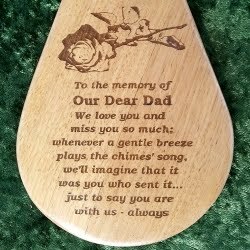 As an option for the gift, memorial or commemorative that you especially want to celebrate, we are able to engrave one or both sides with your image and text inscription, at nominal cost. Please phone or email for details, or visit at one of the venues listed below. And if you are coming especially to any of these, do check with us on the day... just in case!